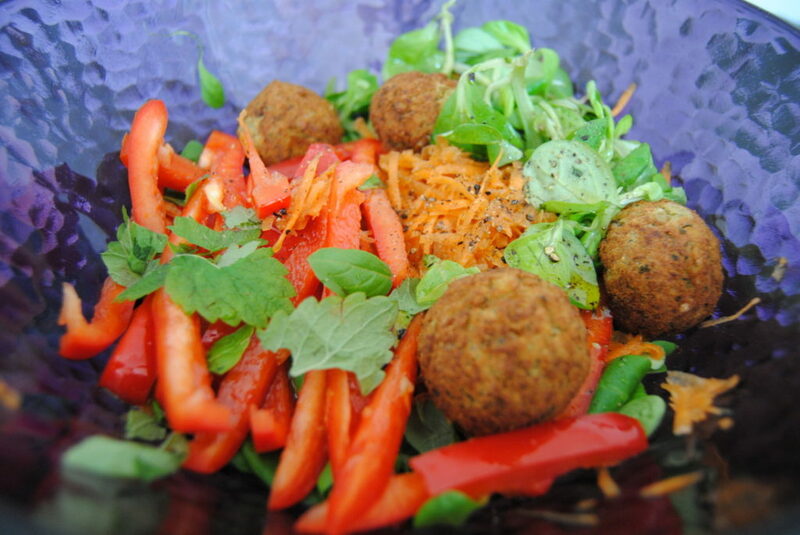 A great way to enjoy a nutrient dense meal is to add falafel to your salad. It is packed with lots of nutrients and minerals that will give you energy, rather than zap it instead. It is possible to buy falafel mix in a box and add water. Most mixes I’ve encountered are made with whole foods and without chemicals, but it is always best to make it from scratch. Plus, it’s not that difficult or time consuming which makes it a lot easier. 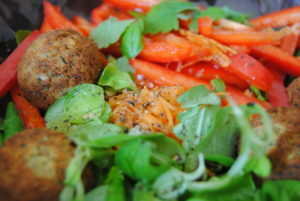 On this particular salad, I added falafel balls that were baked in the oven. 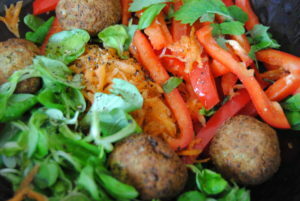 I placed them on top of red peppers, carrots, watercress and fresh herbs. The salad dressing was simple – two parts olive oil, one part balsamic vinegar, squeezed fresh lemon and sea salt.